Scotland was of grave strategic importance during the war because of its geographical position and Glasgow was the location of a significant number of important military and civil organizations as well as housing industry which was vital to the national war effort. Glasgow’s importance attracted enemy attention on many occasions with the city and its hinterland being heavily raided by the Luftwaffe. These raids included the infamous raid on Clydebank on 13th and 14th March which killed over 500 dead and only seven houses undamaged in the town. 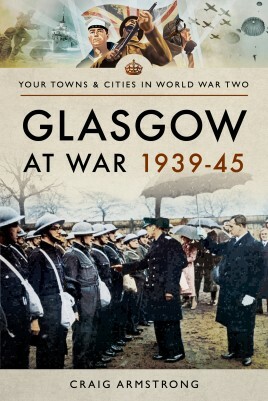 Under relentless bombing the Glaswegians maintained their spirit and remained committed to the war effort. Although Glasgow’s shipyards, munitions factories and other industries were all vital to the war effort so too was the location of the city itself. The Clyde was the end point for many Atlantic convoys bringing precious food, material and men to the war-struck British Isles and the city was thus a vital link in the nation’s war effort. No member of the population of Glasgow escaped the war, whether it was the huge numbers of men and women from the area who came forward for service in the military or in roles such as the Home Guard, ARP services, nursing, working in vital war industries, struggling to maintain a household under strict rationing and the stresses of wartime life, or children evacuated from the city to the rural areas of Scotland to escape the expected bombing campaign. Glasgow was also home to a sizable Italian community which was badly affected by internment and the subsequent tight restrictions on movement and civil rights. The Italian community was also subjected to violent attacks when rioting mobs attacked Italian owned business throughout the city. Edinburgh at War 1939-1945 poignantly commemorates the efforts and achievements of Edinburgh: workers, fighters, families divided, all surviving astounding tests. Born and bred in Northumberland, Dr Craig Armstrong is an experienced historian with a special interest in the history of the North East of England and the Anglo-Scottish Borders. He has expertise in 19th and 20th century history with a particular focus on social and military history. Dr Armstrong currently splits his time between teaching at Newcastle University and working as a freelance researcher and writer on the history of North East England and Scotland.